Which pool system right for you? If you’re a first-time pool owner or upgrading your pool features, choosing a water treatment system is one of the most important decisions and investments you’ll make for your pool. With so many methods available, it’s important to do your research and find a pool system that best fits your household’s needs. The purpose of any pool treatment system is to keep pool water clean and clear. However, not all systems offer the same features, required maintenance, price, health benefits and water quality. To help narrow down your pool system search, we’ve listed the pros and cons of the five top pool systems: chlorine, salt, UV, ozone and Clear Comfort’s hydroxyl-based advanced oxidation systems. Traditional chlorine has been the most common form of pool sanitation for nearly a decade. Chlorine is available in three forms: tablets, liquid, gas and granular. Through a chemical reaction, chlorine oxidizes contaminants in the water. Chlorine acts as a residual sanitizer so it can effectively sanitize the pool long after it’s been added to the water. While chlorine is generally the cheapest form of pool treatment, it also poses a high risk for chlorine-related health issues. When chlorine reacts with organic materials, like lotion, sweat, etc., it produces harmful disinfection byproducts. Disinfection byproducts can cause red eyes, asthma, allergies, dry skin, lung irritation, Lifeguard Lung and other serious health issues. Aside from the health risks, many pool owners avoid chlorine because it can leave lingering pool odor, damage towels and swimsuits, requires manual handling and storing, and is toxic to our environment. Saltwater systems were introduced to the pool market in the 1980s and slowly became popular among pool builders, service providers and owners. Compared to traditional chlorinated pool systems, salt systems provided lower maintenance and had less noticeable harmful effects of disinfection byproducts. Many pool owners choose saltwater systems for the soft feel of the water. Despite popular belief, saltwater pools are not chlorine free. Instead of adding chlorine manually, saltwater systems produce low levels of chlorine from sodium chloride (NaCl). Since chlorine is still present in the pool, there are still disinfection byproducts in saltwater pools. Similar to chlorine, saltwater systems require manual handling and storage. In addition, saltwater pools are corrosive to pool surfaces and equipment, like ladders, tiles, stones, lining, pumps, filters etc. Replacing equipment and putting a sealant to protect your pool surfaces can be a costly repair. UV systems work by flowing pool water over a UV bulb that the denatures bacterial DNA in the water passing over it. UV systems offer a reliable form of secondary sanitation by destroying chlorine-resistant microbes and other unwanted contaminants while reducing toxic chemical use. UV systems essentially sterilize bacteria in the water so it can’t reproduce, but they still leave bacterial cells intact so they can potentially make their way back into the pool. Additionally, UV pool systems can only sanitize water and can’t oxidize it. Since UV systems only treat water as it passes through the system, they don’t provide continuous, residual pool sanitation. This is why UV systems require chlorine for a residual sanitizer, like chlorine or salt, in pool water at all times. Typically, it’s recommended for UV systems to keep 0.3ppm to 0.5ppm of chlorine in pool water. Ozone systems use an advanced oxidation process that injects ozone gas (O3) into the pool circulation system to oxidize pool contaminants and chlorine-resistant microbes. Ozone systems generate an electrical energy that breaks apart an oxygen molecule (O2) to create a chemical reaction that produces ozone. Ozone systems reduce the amount of chlorine needed and are up to 100 times stronger than traditional chlorine. Similarly to saltwater systems, ozone systems can make pool water feel softer. Since ozone systems alone can’t provide complete, continuous sanitation they also require a residual sanitizer, like chlorine, in the pool water at all times. Additionally, ozone is a toxic gas that can accumulate in pool pump rooms and under pool covers. Ozone gas can be corrosive to rubber gaskets, covers and other pool equipment. Hydroxyl-based advanced oxidation systems treat ambient air to create hydroxyls that immediately oxidize unwanted organic contaminants. Clear Comfort’s patented AOP creates more hydroxyl radicals than any other AOP method. These radicals are highly reactive, short-lived & the most powerful oxidative compounds available for recreational water treatment. Hydroxyl-based advanced oxidation systems can help home pools have a clean, soft-feeling, chlorine-free pool without disinfection byproducts. This technology can effectively destroy chlorine-resistant contaminants, without corrosion to pool equipment or materials. Similarly to salt, ozone and UV systems, hydroxyl-based advanced oxidation systems require an occasional algaecide in outdoor pool settings. Due to the technology’s ability to both oxidize and residually sanitize water, the system costs a premium price compared to systems that only provide either oxidation or residual sanitation. Hydroxyl-based advanced oxidation systems provide premium water quality for pool owners that prioritize on health, feeling of the water and sustainability. With any pool treatment method you choose, all residential pools will require six essential elements of pool maintenance: oxidation, pH control, alkalinity, algae control, physical cleaning and circulation. If you don’t know where to start by making your pool system decision, think about the features and benefits that are important to you. 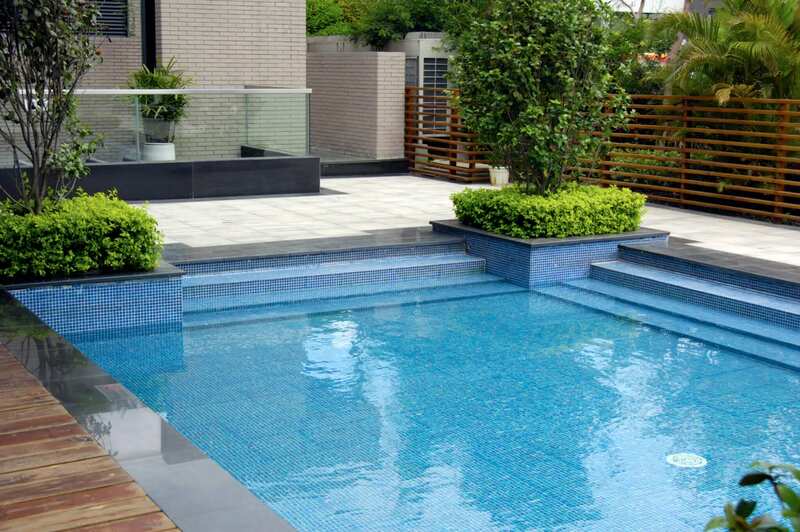 Whether it’s price, ease of use, health, maintenance, environmental impact or feel of the water, there’s a pool system for every type of pool owner. Claire is a swimming and nutrition expert who loves to educate and motivate others to healthier living. She swam competitively for 18 years, is a five time All-American, a Division I National Champion, was co-captain of Team USA at the 2007 World University Games and was named a finalist for the NCAA Woman of the Year Award. She also has a master’s degree in nutrition and is a Registered Dietitian Nutritionist. After swimming, Claire started coaching and has coached all over the US and even in Switzerland! Her experience and expertise about both swimming and health fuel her passion for Clear Comfort’s mission – to make swimming a 100 percent healthy activity for swimmers, coaches, lifeguards and pool staff.